Flexible manufacturing set up and ability to change production set up and other specific parameters quickly per customer requirements. VTG fast and reliable organization enables last minute changes to volume and delivery; providing flexibility to our customers to do a pull in or re-schedule within a short notice. A fast turnaround time for evaluation units is achieved by having a dedicated line, helping them qualify and meet the dynamic demands. Advanced equipment includes solder paste inspection, automatic optical inspection and X-ray equipment for BGA inspection. VTG is committed to superior quality and the environment proven by the ISO 9001 certification. Automatic Solder Paste Dispenser keeps air exposure to a minimum and places solder on all the PCB's copper pads with alignment accuracy of +/- .001 inches with a repeatability of +/- .0005 inches. Two-dimensional vision inspection process verifies acceptable print quality. Computer control system enables the operator to monitor and customize machine parameters to meet critical process requirements. Has ability to accept panel sizes ranging up to 20 by 16 inches with a thickness range of .015 to .5 of an inch. Automated stencil wiper maintains a clean stencil during operation and real time Statistical Process Control (SPC) data allows quality personnel to monitor and correct any necessary process issues. Compact Premium Modular Mounters SIGMA-G4 and SIGMA-G5 achieve high productivity and high quality with functions such as direct drive head, overdrive motion detection apparatus, and linear motor driven XY beams. SIGMA-G4 and SIGMA-G5 allow you to quickly change the head units and tray units so that you can flexibly handle changes of component types. These mounters offer significantly improved maintenance such as easy cutter unit detachment. Contains Eight heads with interchangeable nozzles for high-speed placement of components. The machine is designed to pickup, inspect, align and place up to 18,000 components per hour with outstanding accuracy. CCD camera for alignment, two multi-cameras for component inspection and alignment, and a placement accuracy of +\- .00005 inches. Euipped with Philip's automatic TrayStak™ feeder system that can hold up to thirty standard JEDEC trays, automatically remove empty trays and can load full trays in less than ten seconds. 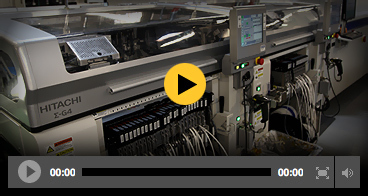 The ultimate high volume Surface Mount Technology production solution with belt speeds up to 1.4m/min to accommodate the fastest pick-and-place systems delivering the highest levels of repeatability with the lowest delta Ts. The most efficient heat transfer from extra high volume, high-velocity, heating modules, producing heater module response of less than one second to temperature changes of less than 0.1°C, thereby maintaining profile integrity for heavy board loads. Seven-zone forced convection re-flow oven. Zones computer controlled - tolerance of +/- 1-degree Celsius. Five heating zones two cooling zones. Fully automated conveyor system that transports and stores completed assemblies into ESD safe magazines. Each magazine can hold up to fifty completed assemblies. When a magazine is full, the 8130 automatically unloads the full magazine and loads an empty magazine to the starting location without interruption. The assemblies in the full magazine can then be safely transferred to inspection, test and packaging locations. Communicates with other equipment via a SMEMA interface maximizing throughput and minimizing idle time. PCBs are moved using vacuum technology eliminating physical contact.